Once you open Pics.io, you can see miniatures of all the assets you have in your digital library. These miniatures are called thumbnails. Being a reduced-size version of your asset, thumbnails help you quickly recognize and organize your files, and do many other things with your assets without opening them. Pics.io fails to show the thumbnails of my assets. What shall I do? Most thumbnails you can see in Pics.io are generated in your Google Drive. Pics.io just “borrows” them. At times, however, Google Drive fails to generate thumbnails properly. In this case, they are not shown in Pics.io either. However, Pics.io does generate thumbnails for a limited number of file formats (the so-called “custom thumbnails types”). These are Sketch, PSD, AI, EPS, TIFF, TIF, INDD, IDML, XD, ARW. INDD files need to have special settings made in Adobe InDesign before uploading to Pics.io. You may check more about the configurations for INDD format here. 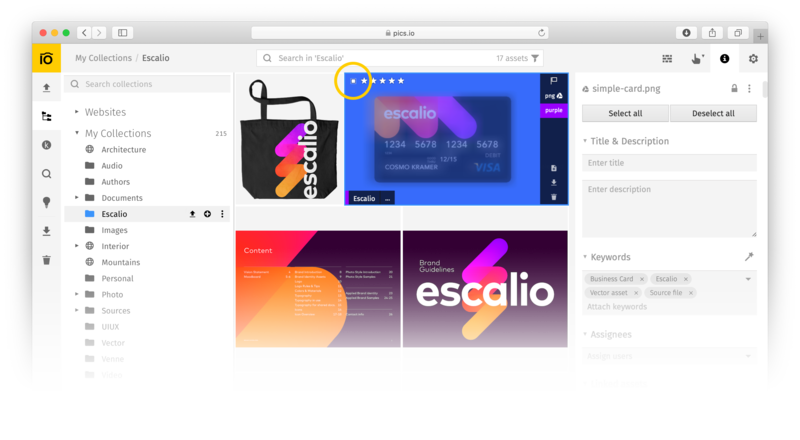 If you happen to have a problem with custom thumbnails types, please send a report to support@pics.io. In case you have a problem with other file formats, please check your Google Drive account first and see if Google Drive has generated thumbnails for your assets. What can I do with a thumbnail? Once you place the mouse cursor in the center of a thumbnail, a little empty box will appear to the left of the stars in the top left corner, and a panel of instruments will appear on the right. A little box to the left of the stars is there to allow you select the file. Once a file is selected, the Infopanel in the right becomes active allowing you to perform necessary operations. You can learn more about other methods of selection here. Stars themselves represent the rating of the file. You can star-rate files right on the thumbnail. 5 stars if the file is perfect, less if perfection is still due. A flag icon situated in the top right corner of the thumbnail has three modes representing the review status of the asset. “Empty flag” mode, which is when it’s transparent, means the asset hasn’t been reviewed yet. “Flag up” mode, which is when it’s white, means the asset has been reviewed and accepted. “Flag down” mode, which is when there is a cross inside the flag, means the asset has been reviewed and declined. You can change between the modes just clicking on the flag icon. Format specification icon gives you a link to the original version of the file stored on your Google Drive. Learn more about files synchronization between pics.io and Google Drive here and here. “Color” button allows you to label the asset with color. “Upload revision” button allows you to upload a new version of the asset. Learn more about assets versioning here. “Download” button allows you download the asset to your device. “Move to trash” button removes it from your Pics.io collection. Learn more about ways to delete the assets here.